From Hampton, VA, and currently living in Virginia Beach, Mike mainly applies abstract expressionism, portraiture, and surrealism. He became serious about art at Hampton High School and furthered his artistic interest at Mount Saint Mary's University in Emmitsburg, MD. His art has been accepted into several exhibitions since 1997 with several awards along the way. Mike's art is currently displayed in several local galleries and other venues. 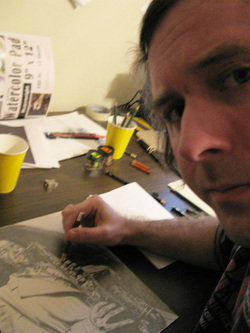 Mike's primary media are pencil, charcoal, and acrylic painting, but he also applies pen/ink drawing and oil painting.